Support inquiry and play with these rich and engaging resources. Provide students with easy-to-read text with a "lap size" version of each book. Bolster language development through wordless photo books, traditional song or nursery rhyme books, and concept books. Improve young readers' basic vocabulary skills with concept cards. 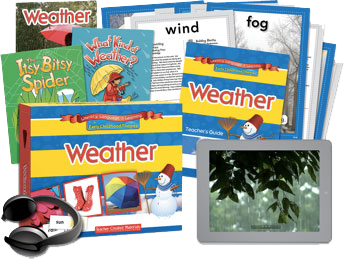 Easily find lesson ideas with a menu of suggestions for all areas: literacy, phonemic awareness and phonics, math, social studies, science, music and movement, and art. Following is a list of the themes available. Click on the title to view a sampler of the kit components.